This is the story of a painting that almost did not happen. Most of the time, I have more ideas than I can ever paint. 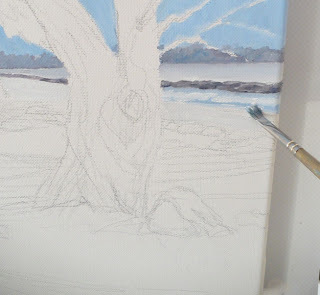 I don't know if it was the bleakness of winter or the post holiday let-down, but I was singularly not inspired to do a January landscape painting in oil on canvas no matter how much I WANTED to do one. I spent hours walking through the countryside looking for inspiration. I took photos and rummaged through all the pictures I had taken throughout the years. 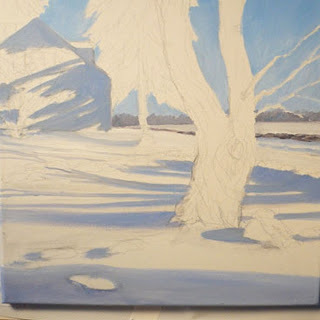 Finally, in desperation, I picked out a photo of an interesting tree in the snow and, putting myself in front of a canvas, picked up a pencil to draw a scene. Sometimes that is the best way to do things. I believe that if I just put myself in front of a project, things will happen. I just have to show up. And so this is the story of "Winter Day". 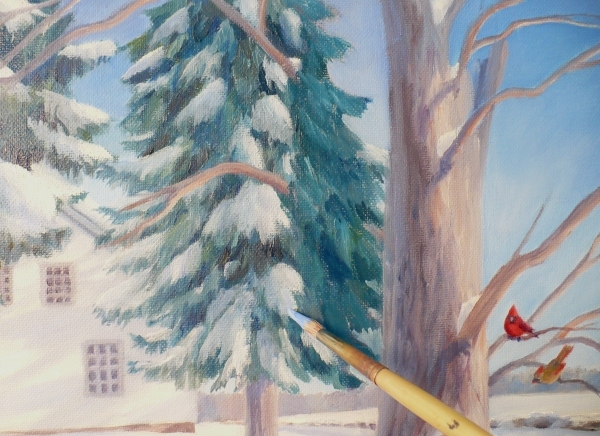 After I began the painting, we had a major snowstorm - 22 inches of the stuff. 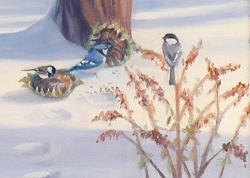 That, along with the birds at the feeder outside my window, helped with the inspiration! 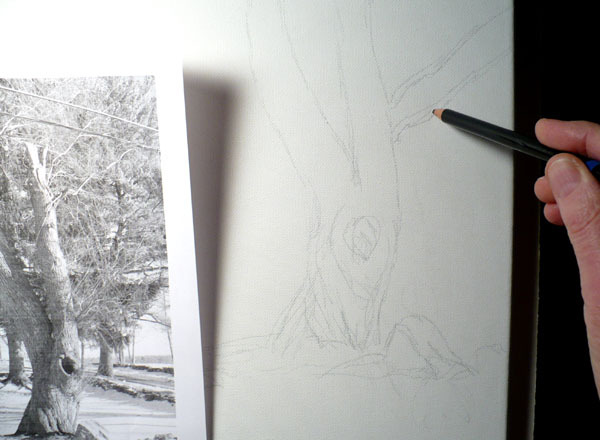 The interesting tree I began with was not the tree I ended up with. 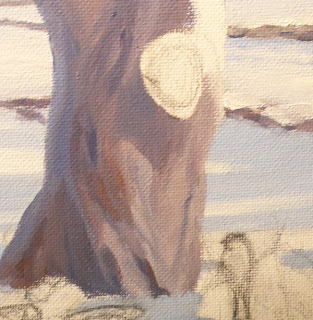 It had two thick trunks which will be good for a different painting, but turned out not to work with this one. However, I did not realize that until later. To do this painting, I made a black and white print-out of the image to use as reference. This helps with seeing contrast and gives me the freedom to use any colors I want without being distracted by colors in the photo. After drawing the composition on a 16"x12" canvas. using the tree, some evergreens and an old house in the background as the main elements, I paint the sky. This is a cloudless day and the sky above is a deep blue. Towards the horizon, it lightens. 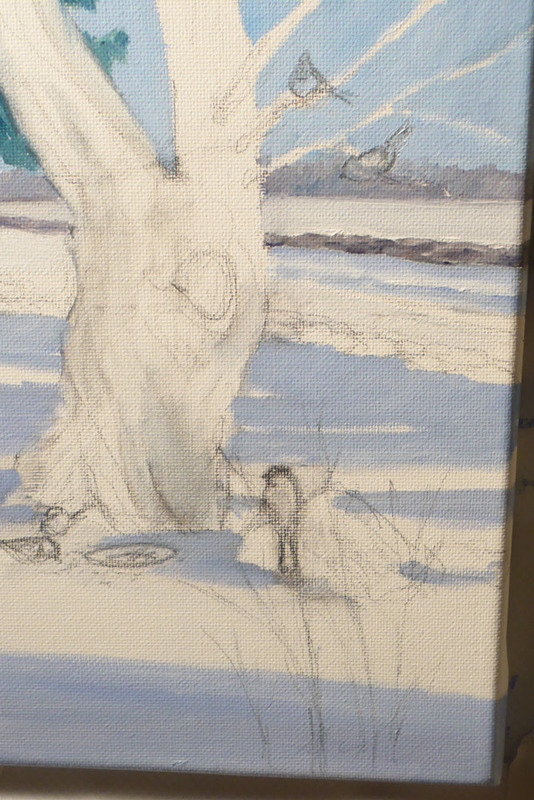 You'll be able to see this more clearly in the finished work. A line of distant trees is painted with a blue gray. Things in the distance look bluer and lighter than those up close, so using bluer and lighter colors will make them appear far away. The field and stone wall is also softened with a blue color. One of my favorite things about painting snow is the shadows. 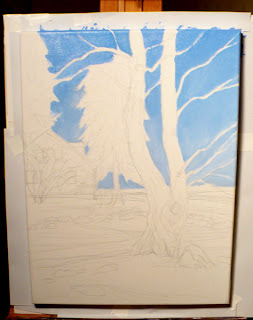 On a blue sky day like this one, the shadows in the distance will look very blue. As they grow closer, they acquire a warmer hue that appears more violet. The shadows on a vertical surface such as the white house are also a bit less blue since they are not reflecting the color of the sky directly. 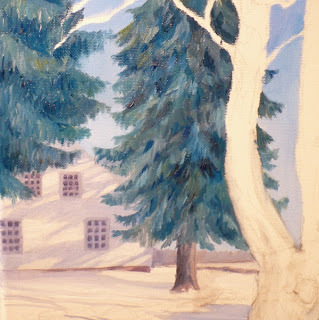 Here I've painted in the windows of the house and the evergreens. 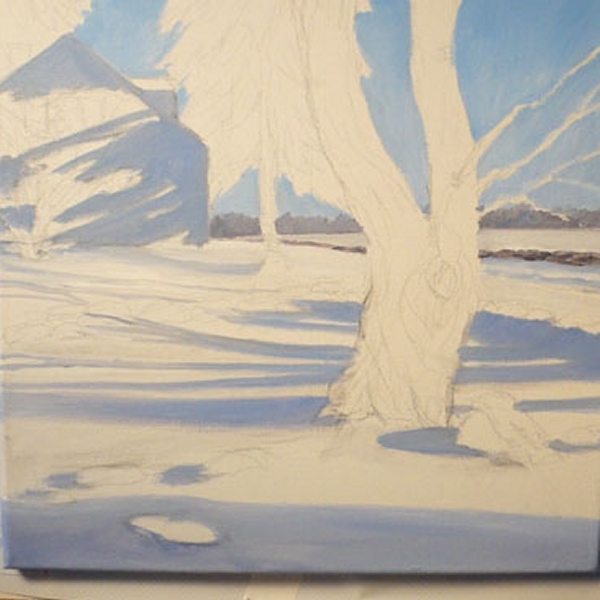 Next, I paint the stone walls partly buried in snow. The stones also are painted bluer the farther away they are. 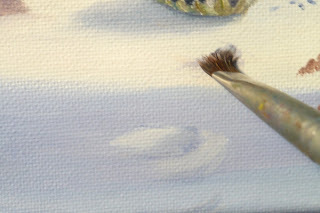 An artist painting a realistic landscape must make the flat surface of the canvas appear to have depth. This is done with color and object size. 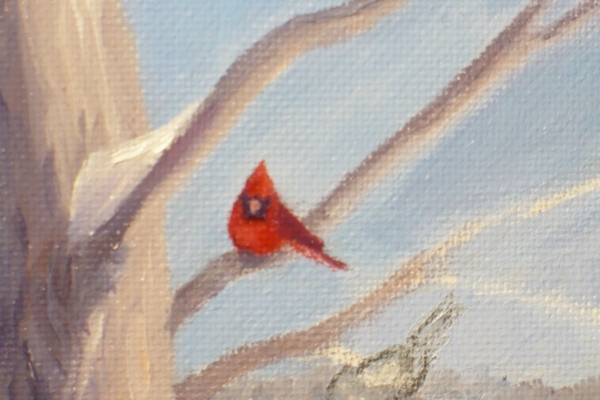 Somewhere along the way, I decide the painting needs birds. I've been doing a series of small bird pieces in watercolor and just felt the need to enliven the scene with feathered creatures. Besides, I have all that great reference just outside my window. So I sketch in some ideas: a few birds and a plate of seeds. 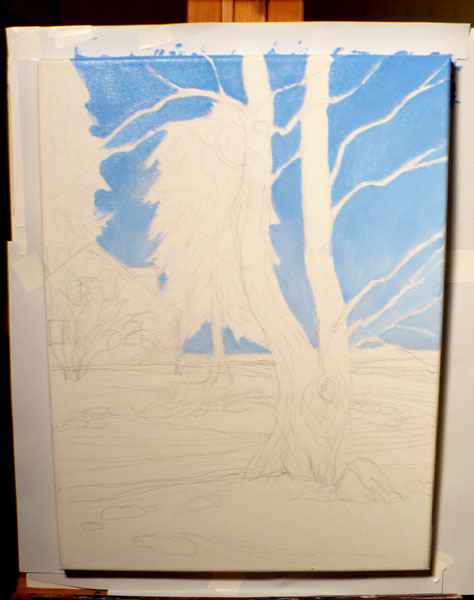 Now it's time to paint the tree. 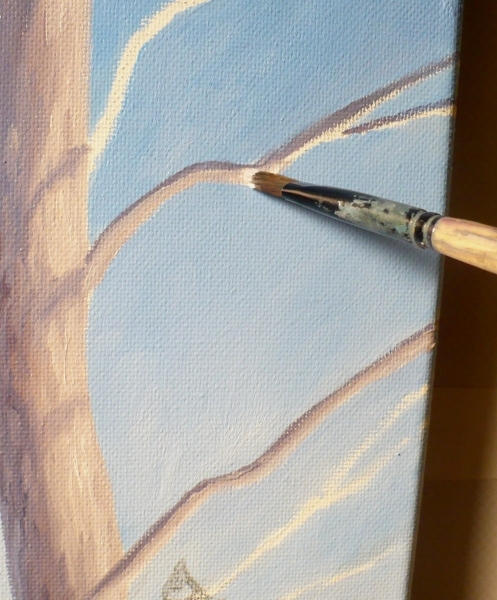 I use a combination of Cadmium Orange, French Ultramarine Blue and white to get the color. The side closest to the light is warmer and lighter, using more orange and white. The shadow side is cooler and darker using more blue. 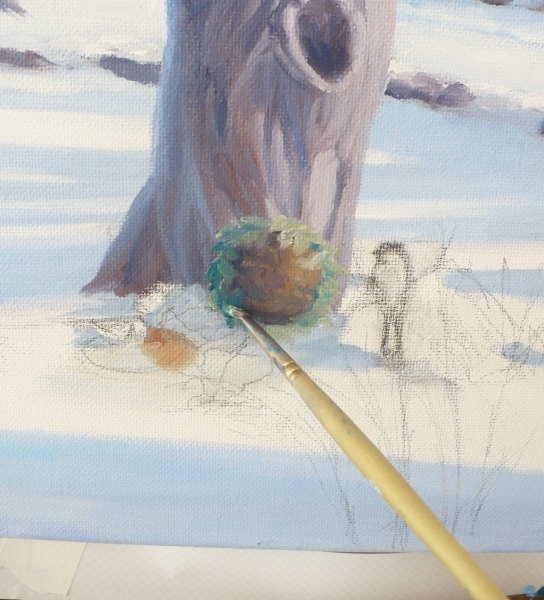 Painting the branches for this winter scene will be a bit different from doing them at another time of year. In winter this far north, the sun is always quite low in the sky. It is so low that the undersides of the branches are lit rather than the upper sides. So I paint the undersides a lighter color to show this. It does help give a wintry feel to the tree. A male and female cardinal sit on some of the branches waiting for their turns to get seeds. Rather than paint a plate of seeds, I had the idea to put out a couple of sunflower heads for the birds. They have been saved for just an occasion as this when food is scarce for the wild creatures. Here I've painted the birds and, since I'm inspired by all the snow outside my window, I am adding some snow piled up against the tree trunk. It was here that I decided to make a single trunk for the tree rather than a double one. All I had to do was paint over the left trunk and widen the right one as you will see. 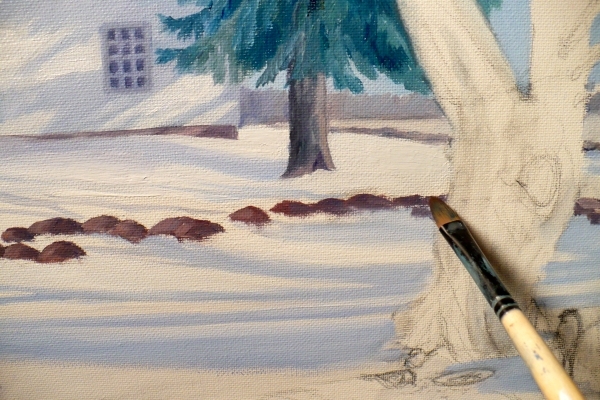 After painting out the left trunk, I pile snow on the evergreens in the background. 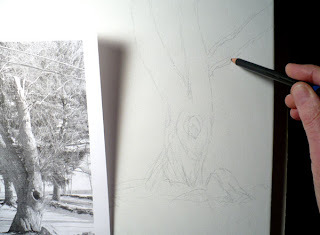 Then I'll connect the branches to the tree. My, this painting is evolving, influenced by the weather outside! Almost done, but there is one last detail I'd like to add. Someone must have put those sunflowers by the tree, and there will of course be footprints in the snow. So I add some. Take a look below for the finished piece. Wow, it seemed to take forever and there were many changes, but finally I'm happy with this painting! This original oil has been sold. Please contact me if you would like to have a print made of this painting. Thanks for stopping by - I hope you enjoyed the demo! I'm with you, Kessie, I'd rather be warm! I have done paintings outside in the snow but that was closer to 35 degrees F. Zero would be much too cold for me! 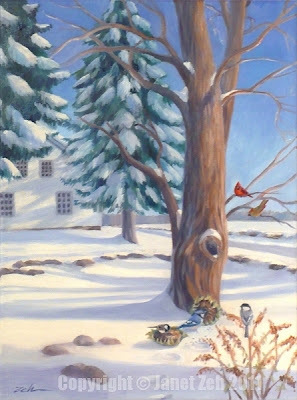 I love this painting, especially the red bird in the tree & the tree itself! You are an amazing artist! 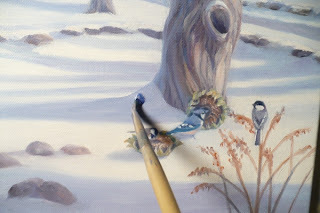 Thank you so much for the feedback on the painting and my blog. So glad you like it! What an adventure! 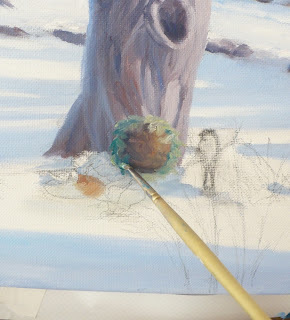 I love the painting and it is fascinating to watch it evolve. Thanks for taking the time to share it with us. Fabulous painting and I appreciate being able to watch the final produact unfold. You are so talented - it is wonderful. Thanks for your comments, Viki. It is always fun to share what goes into creating an artwork. I think it becomes more meaningful that way.